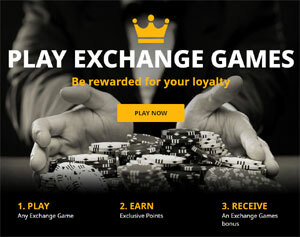 betfair Exchange Texas Hold'em is an innovative new way to play online Poker. Imagine sitting behind a Vegas poker table, being able to see all four hands on the table and bet on any of them - to win or lose! Poker is often described as 'a people game played with cards' but as you're not actually playing a hand, all that psychological mumbo jumbo goes out of the window! No-one can bluff or bully you - you just use your Poker knowledge and betting acumen to recognise the best hands and place your bets at the best odds, making it much more of a 'watch and bet' opportunity. The game consists of 4 players competing for the best 5 card hand in Poker, using 1 pack of 52 cards (all 4 suits of 13 cards). Each player receives 2 unique cards and then 5 community cards are dealt for all players to use. There's no real strategy at this stage, it's more a matter of taking a punt and choosing one of the available options as a pure gamble - taking advantage of the fact that at this stage all players have an equal chance of winning. The exchange reflects this, in that all Hands are showing at odds of 3.98 (approx 3 to 1) to Back and 4.02 to Lay. You can, of course, choose to 'Check' at this point i.e. opt not to place a bet. If you do want to bet, you have 25 seconds (20 in Turbo edition!) to make up your mind! In the example to the right, you'll seed that probability suggests that Hand 2 will win - the exchange odds change to reflect this. You might want to go with this and Back Hand 2, or you could take this opportunity to Lay Hand 2, hoping to attract money from other punters looking to cash in. The three Flop cards are now revealed and the odds of each Hand winning change instantly! You'll notice in our example that Hand 2, which was a clear favourite pre-flop has now drifted to 17.7, again opening opportunities to bet. The River card is revealed and the game ends. In our example game, Hand 4 is the winner, despite having been 3 to 1 pre-flop. At this point, all matched bets are settled. If you've Backed a winner, you get your winnings. If you've Layed a winner, you have to pay out the amount you staked to the winning punter. If you Layed a hand and it lost, you pick up the stakes of the losing punters! Once all bets are settled, the action moves on to the next game - there's a game every few minutes, 24 hours a day, so you never have too long to wait! If the above has whetted your appetite, and you'd like to give Exchange Hold Em (or any of the other Exchange Games) a spin, just click on the link below and we'll take you straight there!